SEND ME A FREE PROOF! YOU'VE FOUND IT! 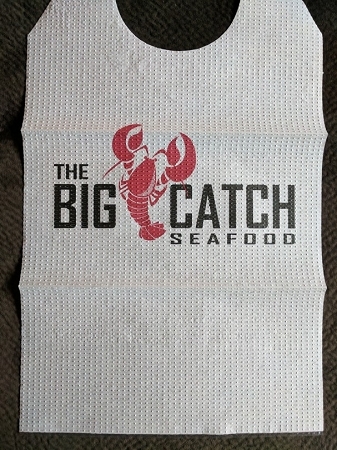 The least expensive smallest quantity, quickest service on custom extra long bibs! Minimum only 2500 bibs! Custom printed extra Long Absorbent Adult Disposable Bibs with Individual Ties that tie around the wearer's neck. HURRY! FREE STANDARD SHIPPING INCLUDED WITH THESE BIBS THIS MONTH! - Poly backed paper, this is a white paper waffle texture tissue cellulose front with a plastic backing with ties. Ties are die cut around the neck. - We can not change the base color of this bib, it is white. - This pricing is for TWO color imprint. ONE - TWO or THREE color imprint is available. 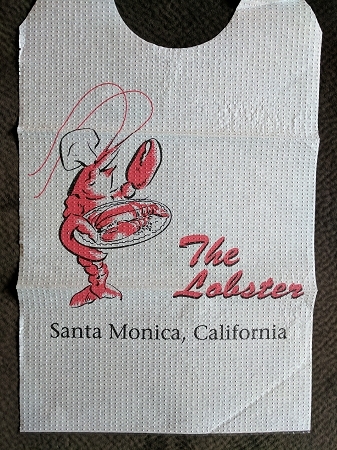 Three color is the maximum amount of colors that this bib can be imprinted. - Our bibs help keep event guests clean as the paper front is absorbent and drips do not run off as they can with plastic bibs. - Stock is never an issue with these bibs. They are completely manufactured and printed in the U.S.A. with all U.S.A. inks and supplies. - Imprint area: maximum imprint area is within a 12" x 18" rectangle area, there is no separate art template necessary. Specify desired imprint size upon order. - Bib is imprinted center/center. - Your vector artwork: submit vector file with all text converted to curves/outlines, black ink on white background regardless of imprint color. Line art and solid fills only, no greyscale, no halftone. - Our artwork: over the last 20 years, we have amassed an extensive design library. Our art is free after you submit a complete firm order. Provide type of event, design request, names, date, location, other text on your order and we will provide artwork choices for you. If you need spec art created without an order, the rate is $45 per hour, minimum 1 hour. - Pricing for quantities up to 99,999 bibs provided here. For quantities 100,000 - 249,000 $.28/ea and 250,000+ $.23/ea + shipping, please email to order. - Minimum is 2500 bibs, less than minimum is absolutely not available. For quantities less than 2500, order the BIB-A3 or BIB-A4FC. - Includes a free black/white email artwork proof. A color virtual email proof $15 upon request, disclaimer regarding color variations from screen to actual item and size/positioning approximates will need to be signed off on prior to processing. 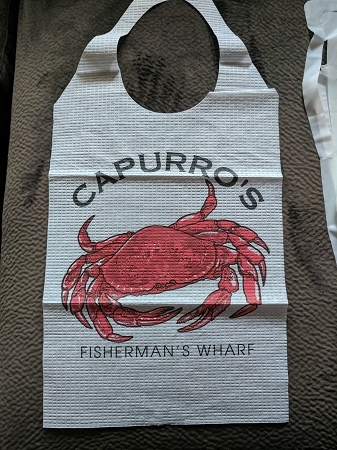 - Random Imprinted Bib Sample is available for inspection prior to final sale purchase of your custom created order, just email your request along with your FED EX or UPS account number. Any concerns must be addressed prior to final sale purchase. - ALL orders must list the required delivery date on the original order and confirmed with proofing. - Standard production time is approximately 10-15 business days from receipt of approved art and prepayment.